After an early education in North Wales, Nye James studied the trombone at the Guildhall School of Music and Drama. Following this there was a period of private study with Denis Wick. He started his freelance career with the Royal Ballet Company, The Royal Shakespeare Company Wind Band, West End musicals and various orchestras. After a brief period with the B.B.C. Northern Ireland Orchestra he returned to London. In the early 1970’s Nye moved to Cardiff to become a founder member of the Welsh National Opera orchestra. He retired from this post in 2006 having also gained some experience of managing the orchestra. 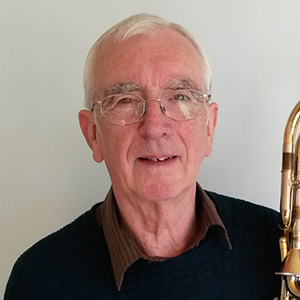 Parallel to his playing career he has taught at schools in London, Hertfordshire and Essex and whilst in Belfast was trombone tutor at the Ulster School of Music. He was also tutor at the Royal Welsh College of Music and Drama for many years and since 1987 has been the brass tutor at The Cathedral School, Llandaff. During his career Nye has performed and recorded with many world renowned singers, dancers and conductors including Luciano Pavarotti, Dame Joan Sutherland, Sir Geraint Evans, Tito Gobbi, Dame Margot Fonteyn, Rudolf Nureyev, Sir Malcolm Sargent, Sir Adrian Boult, Sir Charles Mackerras, Pierre Monteux and Pierre Boulez.